the cake is good but not for this type of party. 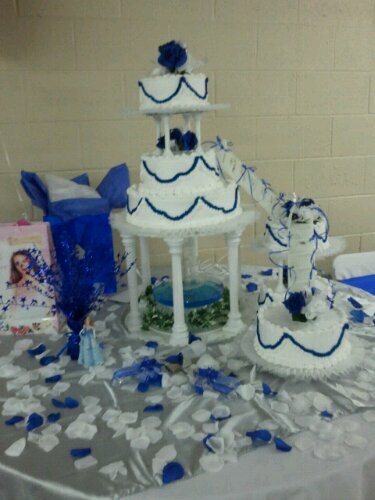 The cake had 4 levels, the base of cake is circular an the first base and level look like a little park and the table have white and blue petals and have a cascade and also had stair in up of the little par had 3 cake of big to little and have decoration with flowers blues and white and the center of cake had a curves blues and of cake of center have stair for other cake medium with the same decoration. The cake looks like a little castle on the white table – it is bulky at the bottom and smaller at the top. It is very elaborate. With some smooth flowers on it, the castle always has the butterflies in a garden of blue roses. There is a bridge what connect 3 cakes together – I think the bridge is plastic. In addition, it is simple with only two main colors- white and blue- but it has a subtle charm. When you taste it, the soft of cake blend with the sweet of cream, it will make a song on your tongue and you just want to eat one more piece. Lots of people think that is a birthday cake, but I don’t think so. I believe it is for a wedding because the newlyweds always hope for a home like that – looking truly peaceful. If you pay attention, you can recognize easily that there are some fake diamond what is attached on the cake. This detail will make the cake to shine with a brilliant light, and you will be lost in fairy tale world -the world just for prince and princess – because of its elegant beauty. The cake was a piece of art. It looked like a big fancy tower from a fairy tale.When you took a little bite, the cake tasted sweet and melted like an ice cream, at the same time filling your mouth with the soft cloud of cream. It was a beautiful and tasteful cake for a 15-year-old girl. This was a cake for one party of 15 years. The cake had the form of a castle with one large base, two medium tiers, and one small on top. They were connected together by a small bridge. In the bottom, it had a fountain of water and a stair running up between two separate pieces of the cake. The round layers in two main colors-white and blue. The texture of the cake was soft. It was a piece of beautiful art. The quinciañera would remember this fairy tale for the rest of her life. And Blue Like The Ocean. Quinceanera cakes may look like a beautiful princess castle in a Disney movie. Imagine a fancy structure in blue and white colors flying over fluffy clouds! This was the impression the Quinceanera cake gave. Towering over a pool, it stood three layers high. The colors are between snow white and deep blue. 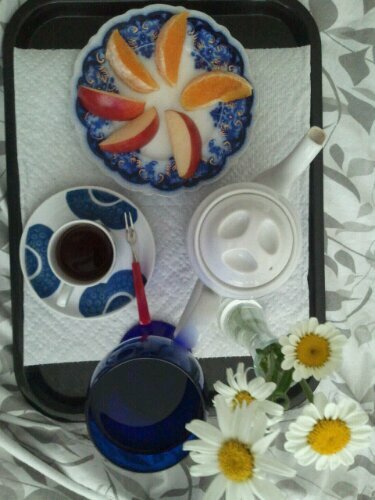 The breakfast tray look like a piece of mosaic in blue and white, and cup of coffee is like oil to the car, the miniature objects in the tray. Rectangle tray with a circles inside. the plates and cup have a traditional round shape. and an energizing coffee and sweet pieces of fruit. The coffee tray was just the thing to start a day! It arrived on a tray in a freach fruits with coffee. The smell of the good coffee and the flowers, it has those colors like yellow, red, brown and white. Even the beautiful of the flowers in the tray and everthing looks very good all organizing. This comment is a model. Please do not rate it for the competition.The breakfast tray was a quick trip to a jolly place by the ocean.The intense yellow of the freshly squeezed orange juice was like bright sunshine.Eggs are a good breakfast and the eggs looked liked a golden stretch of beach with parley shaped like palm leaves scattered around.Even the silverware relaxed on a napkin in a sunbathing attitude.